LaVerne Allison Stetler, 95, passed away peacefully on March 6, 2018 at Celina Manor in Celina,Ohio. He was born on April 12, 1922 to Emanuel and Alta (Allison) Stetler. He was the baby of the family of 7 children and was adored by his older siblings. He graduated from Willshire High School in 1940. Laverne was very active in sports including basketball and baseball. In 1943 he joined the Aviation Division of the United States Navy. He was one of 12 others who transported and dropped bombs from a seaplane. He loved the water, hence his desire to join the Navy, but hated flying and always found it ironic he served the majority of his time on a seaplane. He loved talking with others about his time spent serving his country and the friendships he established while in the Navy. 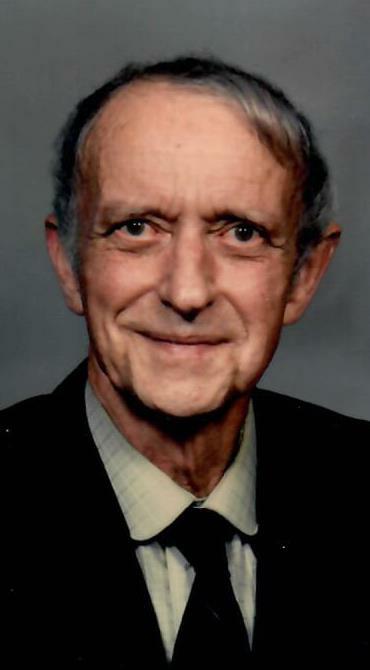 After finishing his service, he began his lifelong career of farming on the family farm and continued until his retirement in the early 1980’s. He had a love of cars, especially Ford models, and could tell you the year, model, mileage and amount he paid for each of his many cars. He was an avid sports fan and loved watching just about any sport, but favored watching Ohio State Football and Pittsburgh Pirates Baseball. If he couldn’t find a game to watch on television, you would find him listening to a game on his AM/FM radio. He also enjoyed being outdoors, listening to music, watching game shows, spending time with family and visiting with friends. He is preceded in death by his parents and 6 siblings: Harold, Lowell, Kermit, Basil, Florice and Neva. He will be greatly missed by surviving family and friends. Visitation will be Saturday March 10, 2018 from 9:00 AM to 11:00 AM with services immediately following at Ketcham-Ripley Funeral Home. Burial will be at Mercer Memory Gardens in Celina, Ohio. In lieu of flowers, the family requests memorials may be directed to Community Health Professionals of Celina. Arrangements are being handled by Ketcham-Ripley Funeral Home.